Uroboros Saga book 5…. this one left me, just like the others, BREATHLESS. Book 5 is told from Ezra’s, Brook’s, Dr. Helmet’s personal archive videos of him and Dr. Madmar, Taylor’s, Perfidy’s, Kale’s, and Silverstein / Uroboros’. We make trips up to the Mars Colony, and trips to Helsinki, Finland. We meet up with old friends, and we make some new ones too. This one is full of death, heartache, blood and war. It is also full of hope, family, friendships, trust and love. I found myself laughing, cheering the good guys on, and crying for those who we couldn’t save. We find out more about who wanted Taylor as a baby, and what he’s willing to do to get her, and quite possibly just how crazy he may be! On one of the trips back to Finland, we pick up after the shutdown, and what became of Abby and Eamon. We see Truman and how he dealt with the death of his dear Marjorie. I just adore Sweet Pea, a kind, shy killer. An asset to Silverstein and gang. Along with her brothers. We meet some not so friendly people in Finland. The epic battle will leave your heart racing and on the edge of your seat!! This series is by far my favorite read of 2015! 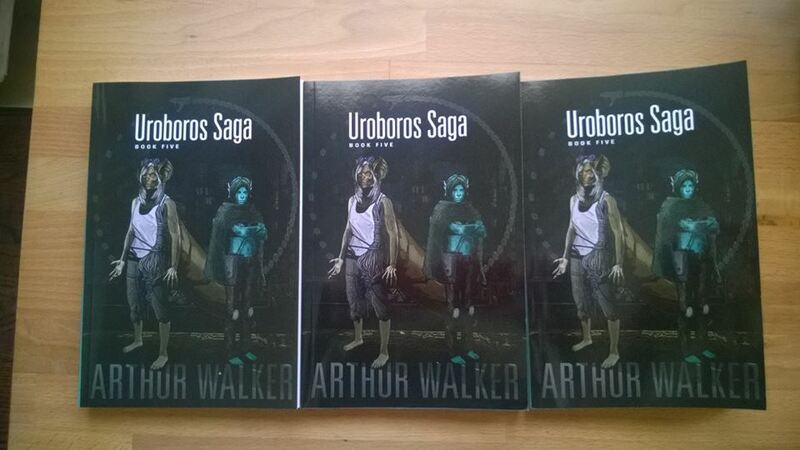 Give Arthur Walker and his amazing UROBOROS SAGA a try. You won’t be sorry!! Or buy all the books on Amazon.com …. only $2.99 a piece.